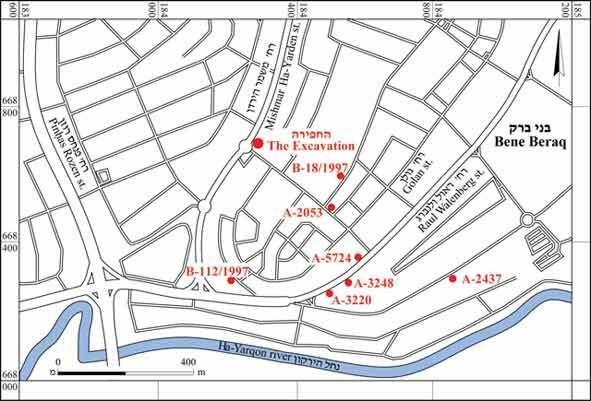 During March 2011, a salvage excavation was conducted at 49 Mishmar Ha-Yarden Street in the Ramat Ha-Hayyal neighborhood of Tel Aviv (Permit No. A-6155; map ref. 184253–9/668703–8; Fig. 1), following the discovery of ancient remains during antiquities inspection of infrastructure work. The excavation, undertaken on behalf of the Israel Antiquities Authority and underwritten by the Mei Avivim Company, was directed by C. Ben-Ari, with the assistance of Y. Amrani (administration), A. Dagot (preliminary inspections and surveying), A. Gorzalczany (field photography and guidance) and D. Barkan (consultation). 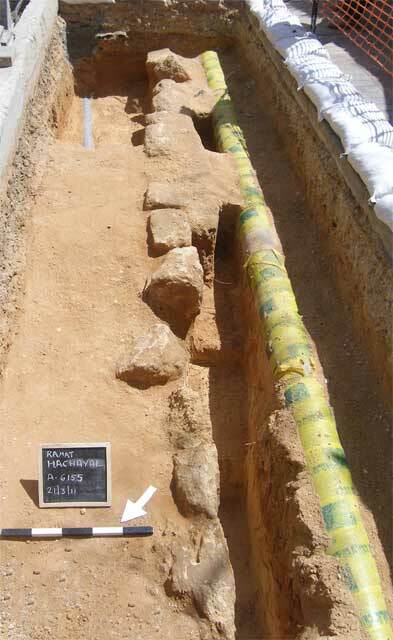 The excavation was carried out within the precincts of the Ramat Ha-Hayyal site where previous excavations uncovered finds dating from the Intermediate Bronze Age to the Early Islamic period, including a burial cave from the Intermediate Bronze Age (ESI 15:58–59), two burial caves from the Byzantine period that contained finds indicative of a Samaritan cemetery (HA 17:9 [Hebrew]); and a Late Roman mausoleum that was converted in the Islamic period to a glass workshop for the production of vessels (I. Taxel 2009, Between Yafo and Apollonia – The Tel Aviv Region in the Late Roman, Byzantine and Early Moslem Periods. In E. Ayalon, ed. The Secret History of Tel Aviv, What Happened Here during 20,000 Years?. Tel Aviv, pp. 127–131). In addition, architectural remains from the Byzantine and Early Islamic periods (ESI 20:132*–133*; HA-ESI 116); two winepresses from the Byzantine period, and two refuse pits from the Hellenistic and Byzantine periods were found at the site (HA-ESI 117; HA-ESI 122). A wall that was probably the shoulder of a road, dating to the Ottoman period, was exposed in the excavation. One square (2×5 m; Fig. 2) was opened and a wall (W104; length 5 m) oriented east–west was exposed; it was built of a single row of roughly hewn kurkar stones (average dimensions 0.30×0.35×0.40 m) without mortar. A level of tamped earth (L107; length 2.2 m, width 0.07–0.30 m), consisting of packed grayish sand mixed with pieces of kurkar, abutted the middle part of the wall from the west. Wall 104 (Fig. 3, 4) was flanked by two parallel modern infrastructure channels. The channels damaged the ancient remains and severed the level of tamped earth that abutted the wall. The base of a black Gaza ware jug from the Ottoman period was exposed while dismantling some of the stones in W104. It was difficult to identify the nature and purpose of the finds due to the limited extent of the excavation and the damage caused to the remains. 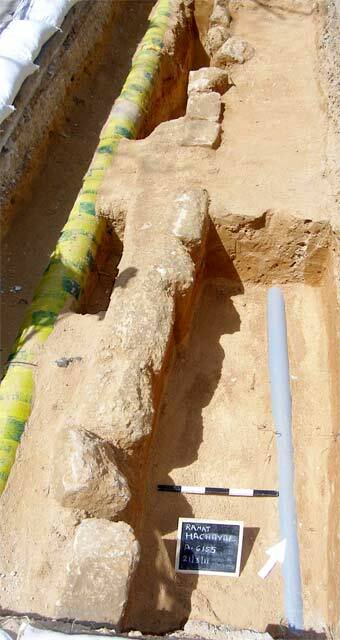 The Ottoman vessel found in the wall indicates that it does not predate this period. 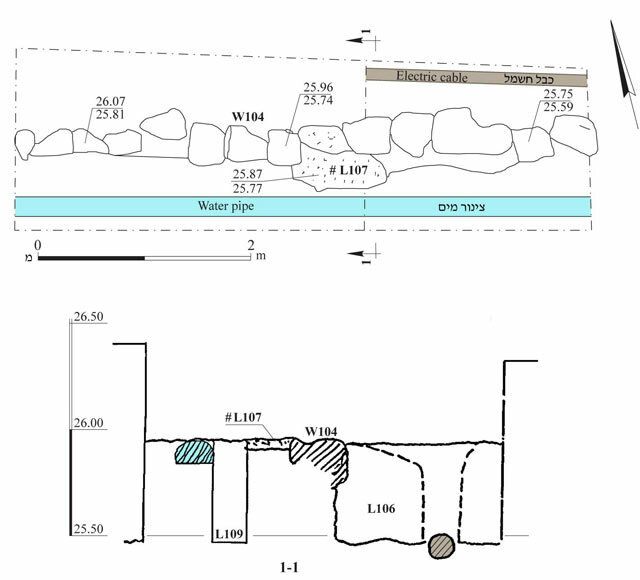 The manner of construction and the absence of small finds indicate that the wall may have been the shoulder of an ancient road that presumably continues beyond the limits of the excavation. It should be noted that remains from the Ottoman period are exposed at the site for the first time. 3. Wall 104, looking east. 4. Wall 104, looking west.